Goats are foraging ruminants just like cattle. In nature goats met their nutritional needs by roaming to find plants, licking on mineral deposits and other plant material and consuming fresh, clean water free choice. We now confine goats to dry lot paddocks, pastures or stalls. Our product choices support feeding dairy or meat goats either free choice or scheduled feedings. Many people believe that animals know what their bodies need. In nature they would find it. Goats kept in stalls and dry lot paddocks certainly can’t roam to meet their nutritional needs. Goats that are kept on pasture are still confined to some degree and can’t roam very far to find various plants and mineral their bodies may require. We offer products that support free choice feeding for your goats unique living situation. Dairy goats tend to be a bit fussier than meat goats as they are typically fed alfalfa hay and a grain mix. The recommended choices below reflect this characteristic and the need for improved milk production, quality and taste. This product is a non-molasses, non-starch free choice lick tub. It contains protein, vitamins, minerals, flax, yeast, live enzymes, pre-biotics (for digestive issues) and much more. This lick is available in a 125lb size. The Diatomate lick tub is a non-molasses, non-starch free choice lick tub. It contains protein, vitamins, minerals, flax, yeast, live enzymes, pre-biotics and diatomaceous earth. According to some veterinary sources diatomaceous earth helps with parasite control. Click here for more information in our Diatomate lick tubs. This all-natural, non-molasses, non-starch free-choice lick tub was designed specifically for horses. However, many of our dairy goat customers prefer this lick option as it provides added ground flax, vitamin E and diatomaceous earth giving further support to lactating animals. . It comes in 50lb, 125lb a 250lb sizes. We expect goats to consume .25 to .50lbs per day per animal. Consumption depends on quality and amount of forage, time of year, stress or demands placed on the animal’s body such as pregnancy, lactation and/or illness. Redmond Naturals offers sea salt (with over 50 trace minerals) in two free-choice versions: Redmond Rock (7 lbs) or a Redmond 44lb Lick Block version. The Redmond Lick block comes in seven types. The EquiDisk is an all-natural equine treat designed to reduce the stress and boredom for animals housed in stalls, on stall rest for injury or illness, show stalls or any other reason your animal may need a non-molasses treat for fun and nutrition. Fresh start is an all-natural, non-molasses, non-starch loose supplement that is intended for hand feeding. Fresh start contains all the protein, vitamins, minerals, yeast, live enzymes, pre-biotics and diatomaceous earth for your elk’s nutritional needs. Fresh Start can be ordered in 50lb bags or 2,000 lb totes. Click here for more information in Fresh Start. EquiPride is SweetPro’s horse top dress intended for hand fed situations. This product is just like the Fresh Start, but contains, added Vitamin E, biotin, and ground flax for added immune system support. It also is available with diatomaceous earth. Click here for more information in EquiPride. Redmond Naturals provide a sea salt, volcanic ash (toxin binder) conditioner, and a kelp mix in hand-fed bagged versions. The salt, conditioner and kelp mix is available in 50lbs bags or 2000lb totes. Click here for more information about Redmond Naturals. McNess Distiller’s cubes are an all-natural hand fed treat for all livestock. They are high protein (26%) and high fiber (10%) treats or fed. Click here to read about Lakayla of Arapahoe County, Colorado using SweetPro Fresh Start with her 4H market goat. Click here to read about Aleya of Adams County, Colorado using SweetPro feed supplements with her 4H goat. Click here or on the video below to hear about how the Campbell ‘s Boer Goats’ health improved after feeding SweetPro. 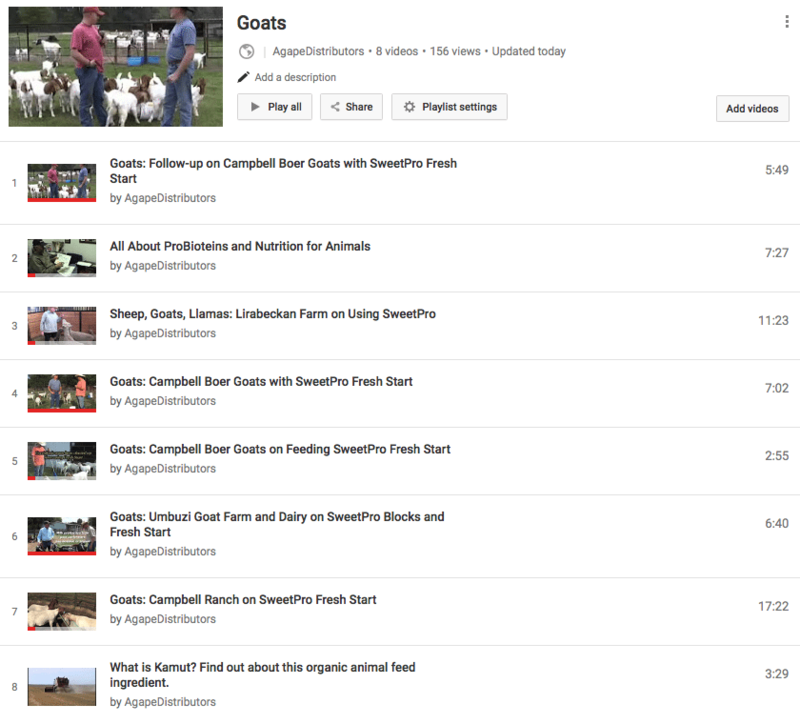 Click here to view more videos about goats. Get the Agape Nutrition News today. We look forward to keeping you informed! We have natural and organic feed options for most every animal. Sign Up for Free Nutrition News! We have had a lifelong love of animals and are committed to their well-being by providing quality natural and organic products.